In the autumn of 2012 I started a little exercise in adventure design, applying the techniques described in my Campaign and Scenario Design articles, and outlined a megadungeon. This has proven to be a popular series, and I’m happy to finally find time to add it to my Hall of Fame. From time to time I posted some thoughts on theory and status of development. Drilling Deeper expanded the definitions of the regions and started to explore the relationships between them. A Bit of Math is an early evaluation of the material, including how much time had been spent, how much more might be needed for this stage of work, and what might be involved in making this a product. Status Check is an intermediate review of my progress, examining the work overall. (Halfway) Complete Graph shows a picture of all the regions and areas I know of in the megadungeon at that point, with placeholders where I have not fleshed out the intermediate details yet. 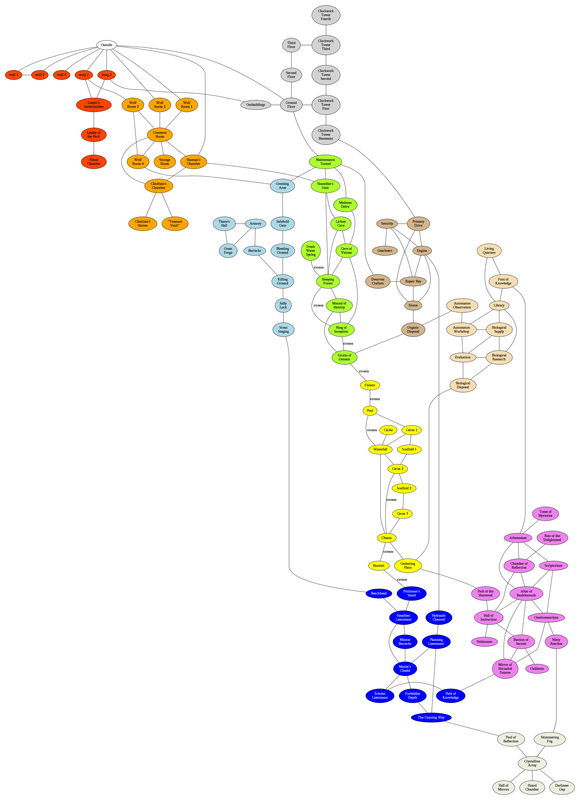 (Almost) Complete Graph, a few days later, shows much the same thing with only two regions not yet expanded. All Regions Outlined shows the final version, at this level of detail, of the megadungeon. Information Paths describes how the players might find clues and hints about what else is in the dungeon, particularly when those clues and hints point at regions farther afield than the ‘immediately adjacent’ regions. We even had a few sessions exploring the megadungeon, but discovered that Wednesday nights are a singularly bad time for working people to try to game. Session 1, I Swear this was not Planned was written after a session at or near the height of the ‘9 rats, 2000 copper pieces’ incident. I didn’t mean to riff on it, but the way things played out pleased some of my players, including the one that GMed the session that kicked off the whole ‘9 rats, 2000 copper pieces’ thing. Session 2, Inadequately Planned was a less than glorious session that was distinctly disappointing due to inadequate preparation on my part. The material I had at hand was enough to build on, but needed more prep time than I had spent. Perhaps useful as a cautionary tale. Session 3, Elves are Jackasses demonstrated to me that being able to roll when player inventiveness, to be polite, can work rather better than whatever had previously been planned. Things got a little silly, and a lot fun, that night. To add to this, Gus at Dungeon of Signs wrote a thought-provoking article about how the megadungeon material could be expanded on to make it more usable in play, rather than a framework developed as part of an exercise, and I largely agree with him. Gus also felt inspired to draw a ‘megadungeon tourist map‘ that tickles me something fierce. All in all I’m really pleased with how this turned out. And even then, there was room for improvement. Lionel di Giacomo made wonderful suggestion about path transitions, notes about the edges between the nodes. These notes might be used during development, as many notes might be, but they might be sufficient for good improvisational GMs to work with in that form. I’m still considering polishing this a bit more, adding some more detail in places (encounter tables and the like, if nothing else, and perhaps some set piece encounters), then publishing it in PDF. I might also create a polished document describing the theory behind the construction, and use the megadungeon as an example of applying those processes. Pingback: T-Bag Swings Into Action! | Keith Davies — In My Campaign - Keith's thoughts on RPG design and play. Pingback: Geographical Assignment in the Sandbox | Keith Davies — In My Campaign - Keith's thoughts on RPG design and play. Pingback: Points and Nodes and Paths, Oh My! | Keith Davies — In My Campaign - Keith's thoughts on RPG design and play.